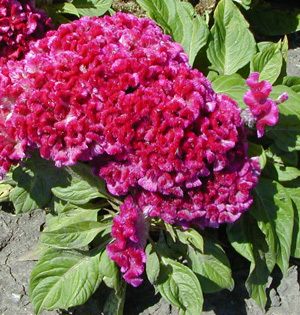 Cockscomb celosia, with fasciated flower heads, is grown for its unusual ornamental appearance. 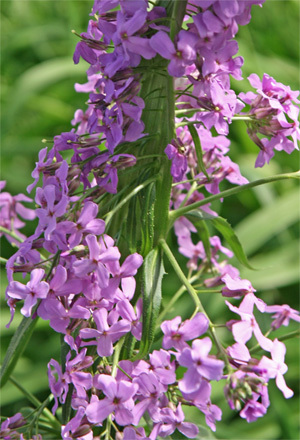 Dames Rocket (Hesperis matronalis) with fasciated flower stem. 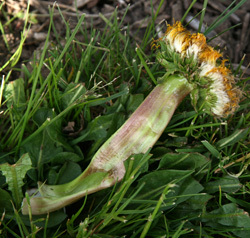 It may appear like several stems have been fused so that the stem looks like a wide, ribbed ribbon (fasciation comes from the Latin word fascia which means “a band” and refers to anything which resembles a wide band in shape); stems may be bent or coiled in abnormal directions; numerous growing points may develop to produce a witches’-broom effect; flowers and leaves may appear at odd angles to the stems and the leaves growing from distorted stems are usually smaller and more numerous than normal; or flower heads may be elongated, deformed, or misshapen with more flowers than normal. There is also a much rarer type, ring fasciation, with a ring-shaped growing point, which produces a hollow shoot. Helichrysum ‘Giant Flowered Tall Mix’ showing distorted flowers. 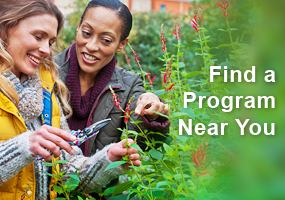 Although this condition is not common, it has been recorded in hundreds of different plant species, including ferns, woody plants, herbaceous annuals and perennials, and fruits and vegetables. Most coniferous and broad-leaved trees and shrubs can bear fasciated branches, but some are far more susceptible than others to malformations. It is most common in the plant families Cactaceae, Compositae, Leguminosae, Onagraceae and Rosaceae, and among species that have indeterminate growth. 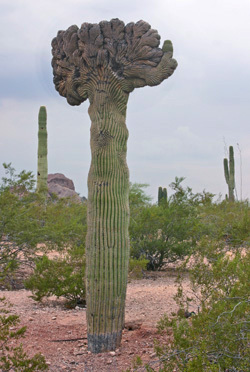 Certain fasciated plants are prized for their unusual appearance, particularly the undulating folds of growth on cactus plants, where the growth may eventually become convoluted, somewhat like a brain. In some cases the changes are so dramatic that the resulting cactus plant loses almost all resemblance to the original species. Fasciated specimens of cactus and other succulents with their unusual forms – which can often be perpetuated by vegetative propagation – are highly sought by collectors. 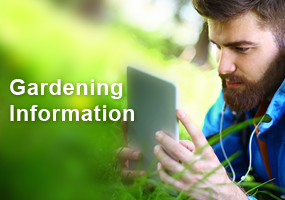 Some plants seem to develop this condition more readily than others, suggesting a genetic tendency. 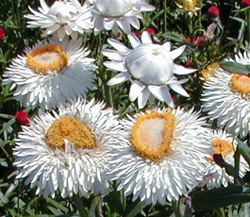 Many of the ones perpetuated by vegetative propagation become cultivars with descriptive names such as ‘Monstrosa’, ‘Cristata’or ‘Tortulosa’. Copiapoa dealbata in habitat in Chile (L), and closeup of natural, fasciated specimen (R). Fasciated cactus: Mammillaria geminispina Cristata (L) and M. spinosissima (R). Echium sp. : normal (L) and fasciated (R). Euphorbia sp. : normal (L) and fasciated (R). Japanese fantail willow (Salix sachalinensis ‘Sekka’) is a clone with fasciated stems propagated from cuttings. The “cockscomb” cultivars of celosia (Celosia argentea var. cristata) are grown especially for their dependably fasciated flower heads, a trait that is passed on in the seeds. And some dwarf conifers with abnormally dense stems or odd branching patterns are fasciated plants. Cockscomb celosia cultivars (Celosia argentea var. cristata): ‘Toreador Red’ (L), ‘Bombay Wine'(LC), ‘Amigo Yellow’ (C), and ‘Amigo Scarlet’ (RC), plus the not normally crested Celosia spicata’ Punky Red’ (R). 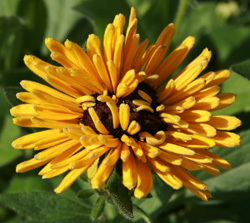 Rudbeckia flower with distorted growth. The cause of fasciation is varied, but not well understood. In some cases this irregular growth is apparently triggered by infection (by bacteria, viruses or phytoplasmas), feeding by insects or other animals, chemicals or mechanical damage. Somatic mutations, hormonal imbalance, and environmental causes such as extreme weather have also been implicated, but in most instances fasciation appears by chance with no obvious cause. In some plants a single recessive gene controls this condition, although the degree of expression is often very dependent on environmental conditions. 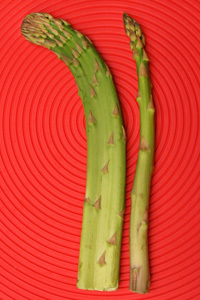 Fasciated (L) and normal (R) asparagus spears. Scientists have identified two genes in Arabadopsis (the lab rat of plant research) that cause fasciation when mutated. 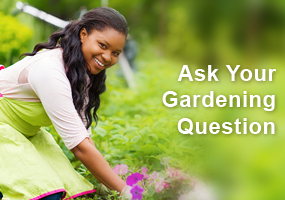 Some plants may inherit the trait, while in others the condition is not stable and affected plants may revert to normal growth from a fasciated growing point. While fasciation affects the plant’s appearance, it has little effect on the health of the plant and affected plants have the same cultural requirements as normal plants. Romanesco broccoli: normal head (L) and fasciated (R). I have seen several instances of fasciation in dandelion in my yard, as well as in hosta, Sempervivum, and ‘Romanesco’ broccoli. Keep an eye out in your own yard for the unexpected surprise of these random, fascinating oddities! I have two lemon cucumbers with it. One, has the traditional “flattened” growth point. The other has a HUGE round growth point, and the flowers are encircling the stem in clusters, rather than in separate points. Do you want photos sent to you? Please tell me how I can send photos to you. I have a couple of orchid cacti that i was told is fasciated. It shoots up tall stems that are thin and about 1/4 inch thick. They shoot up quickly to anout 4 feet tall. At the very top, the stem will start to develop a little wider, flatter stem, more like the typical orchid cacti stem. Is this what is happening? I cannot find a picture of what this is. It really looks odd. Please let me know if this is what is happening. I appreciate it.